Questions and Worked Solutions for AP Calculus AB and BC 2014. 2. Let R be the region enclosed by the graph of f(x) = x4 - 2.3x3 + 4 and the horizontal line y = 4, as shown in the figure above. 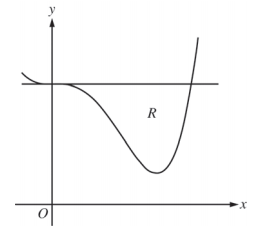 (a) Find the volume of the solid generated when R is rotated about the horizontal line y = -2. (b) Region R is the base of a solid. For this solid, each cross section perpendicular to the x-axis is an isosceles right triangle with a leg in R. Find the volume of the solid. (c) The vertical line x = k divides R into two regions with equal areas. Write, but do not solve, an equation involving integral expressions whose solution gives the value k.